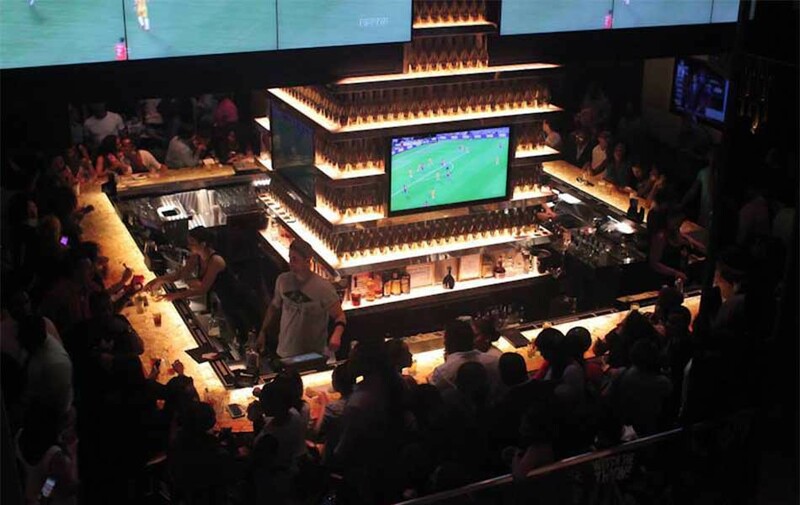 The 40/40 CLUB, an all-American sports bar and lounge owned by hip hop mogul Jay Z and partner Juan Perez, opened its doors to the public on June 18, 2003. Created by the longtime friends, the club is 12,000 square feet of pure sports and entertainment in an opulent lounge setting that combines the lavish warmth of a New York City penthouse with the vivacity and glamour of courtside seats at a championship game. “I love sports and wanted to create an environment that is conducive to match my lifestyle, while watching the games at the same time,” said Jay Z. The recent $10 million dollar renovation and expansion of The 40/40 Club draws inspiration from the grandeur and opulence of New York City nightlife. The multi-level space includes a custom 20’ x 20’ illuminated resin top bar encircling an 18-foot tall illuminated champagne tower. Supple leather upholstered wall paneling, custom walnut millwork with smoked bronze mirrors, and plush lounge banquets make the space feel luxurious. A large marble stepped arena style seating area can accommodate guests with a wonderful view of the 4 165in state-of-the-art video walls. A new second floor ‘catwalk’ allows guests to circumnavigate the ‘scene’, and relax at the semi private second floor mezzanine bar and seating area. The space also includes over 30 55in flat screen monitors and a one-of-a-kind jersey hall of fame featuring the 40/40 club members.